Benjamin E. Nelms, Ph.D. is the inventor and developer of “Golden Rule” software which is a new technology that imports complex digital medical data and automatically renders patient-specific education media for cancer patients and their families. 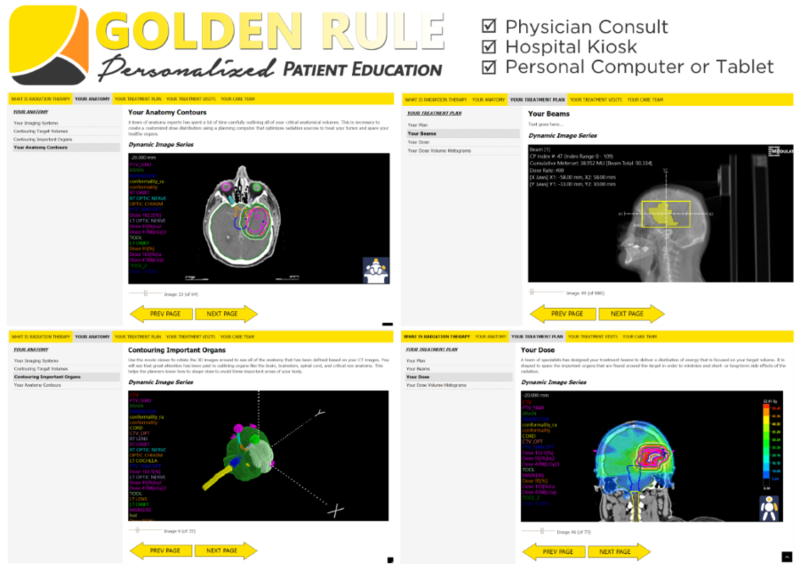 Golden Rule produces an intuitive, media-rich, easy-to-use training guide to give to each of your patients – specific to their treatment, staff, methods, concerns, and interests. And for the busy clinical staff who use the Golden Rule media generation software, it’s very easy to customize and tailor to what your hospital and team of physicians wants to emphasize in the training. Golden Rule is a groundbreaking tool for personalized medicine in radiation therapy. Electronic outputs can be reviewed in an browser, so they are easily accessed in the physician’s office, at a dedicated hospital kiosk, or at home on a tablet or computer. No special software needs to be installed to run the education module, and the patient can interact and train at any time and at their own pace. To set up a demonstration or to apply to be an early adopter, please contact Canis Lupus LLC. © 2019 Canis Lupus LLC.